This is not a Gufram production Capitello but an Italian period made prototype to their example The Capitello Lounge chair is one of the icons of the Italian Radical Design movement in the 1970s This example can be used as a chair but is not for very intensive daily use It will be a bespoke piece in every modern interior and will be ideal for photo shoots or dressing a big room for real estate photo's. An Italian 1970s body sculpture by Vandoni (signed). This art work is made of resin mixed with brass powder. A bespoke piece for on your wall. 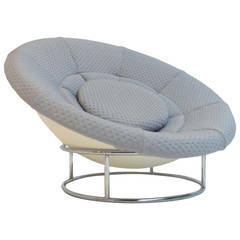 exceedingly comfortable large rotating lounge chair in typical 1970s 'catcher's mitt' style. A wonderful example of a vintage lounge chair, great lines. - Made of oakwood - Quality, fixed Czechoslovakian lounge chairs - Partially renovated - Original upholstery - Very good condition - Were at the hotel in Prague. The chairs were made on order. Unique pieces. Massive beech wooden frame. Good original upholstery. Nice design. Four pieces available. 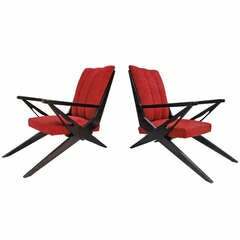 Pair of chrome cantilevered lounge chairs in the style of Milo Baughman These have been professionally cleaned, but new fabric might be preferred. Great lounge chair made of metal and faux leather cover. Origin and designer unknown. The armchair comes from the 1970s. W 69 cm x D 94 cm x H 68 cm x SH 38 cm. Very good condition.